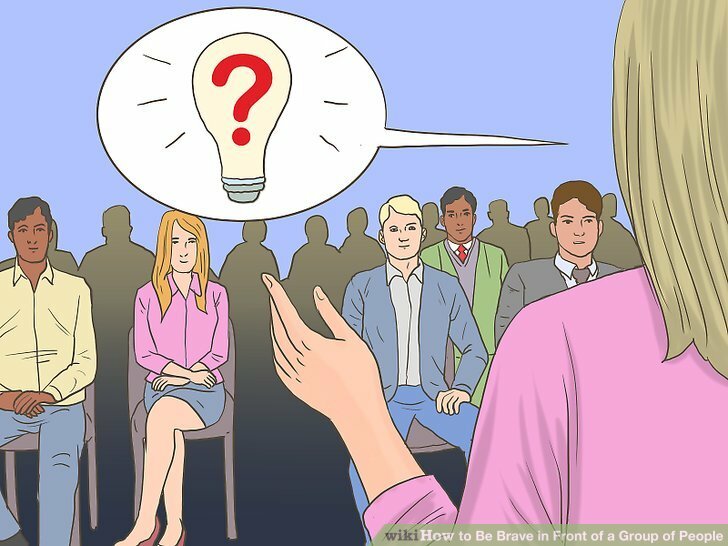 Talking in front of a group of people can be a nerve-wracking experience. Public speaking is one of the most common fears, but you can still talk to a large group even if you’re feeling nervous. Whether you’re giving a speech, trying to speak up at meetings, or talking with friends, staying confident will help your voice be heard! Practice before you need to get in front of people. 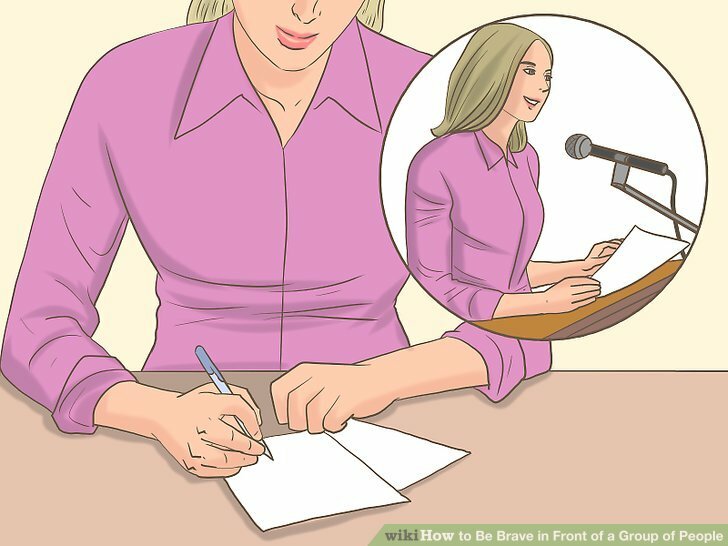 Start by reading your speech out loud without anyone around so you get used to giving your presentation. When you get more comfortable speaking to yourself, find family members or close friends that will listen in a private setting. Ask for any feedback and try your presentation multiple times until you feel comfortable in a group. Work your way up to presenting in front of a large group. Try speaking to 1 person and gradually increase how many people you invite to listen. 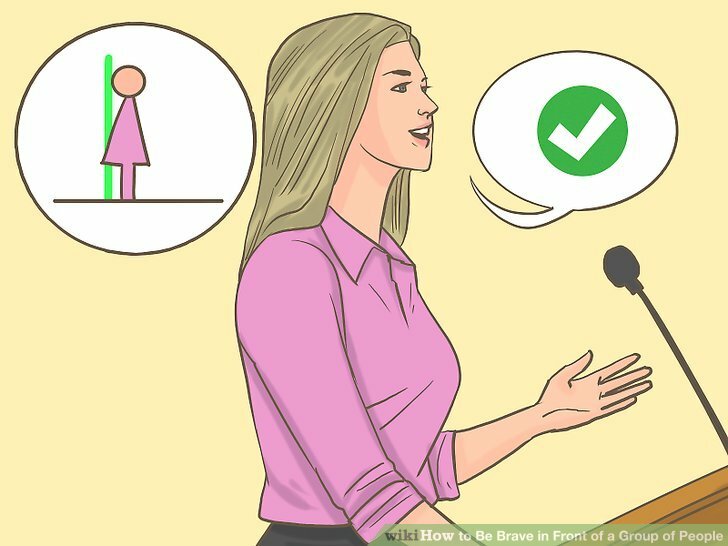 If you can, use a microphone similar to what you’d use at the final presentation. Double check any notes or outlines you’re using while you speak. Make sure any electronics you’re using during your presentation work and that all distractions are turned off. Look over any note cards or documents you’re using to make sure everything is in the correct order. If you need to, make adjustments with a pen and highlighter so you can easily see them while presenting. 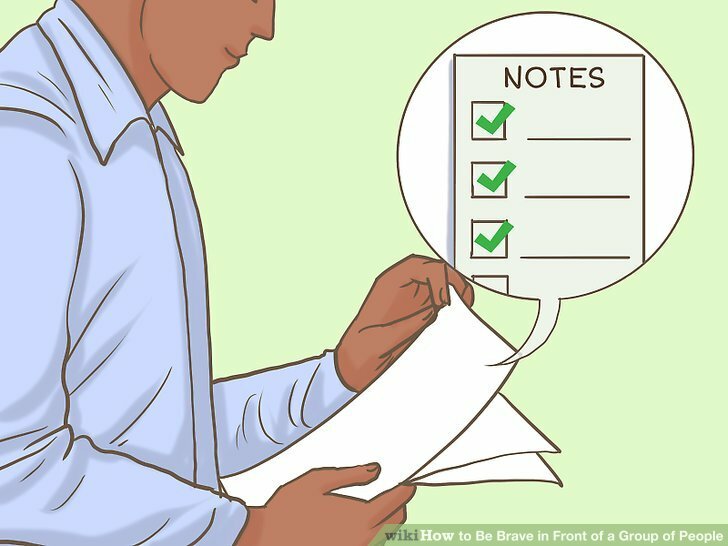 Do your best to memorize as much of your speech as possible just in case you leave your notes at home or there are technical difficulties. If your speech relies on visuals, make sure to practice explaining what your pictures or graphs are in case the projector doesn’t work. Do a few stretches to loosen up. When you get nervous, your body will feel tight and stiff. 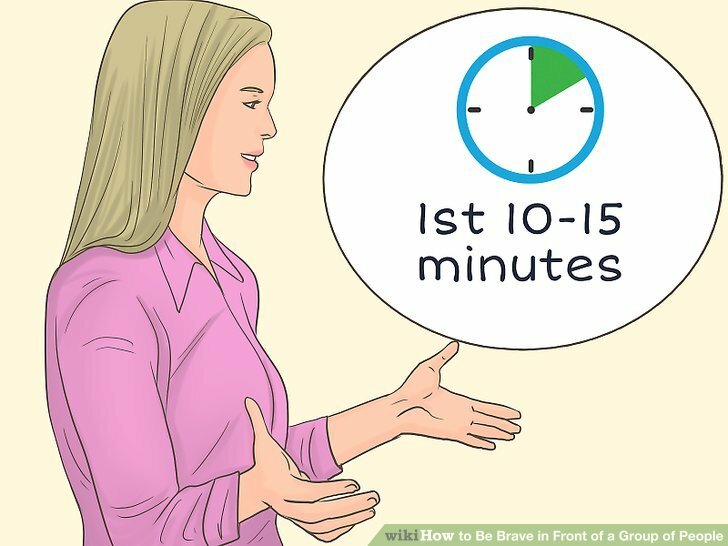 Stretch your arms, back, and legs 15 minutes before you’re supposed to give your presentation so you don’t feel as tense. 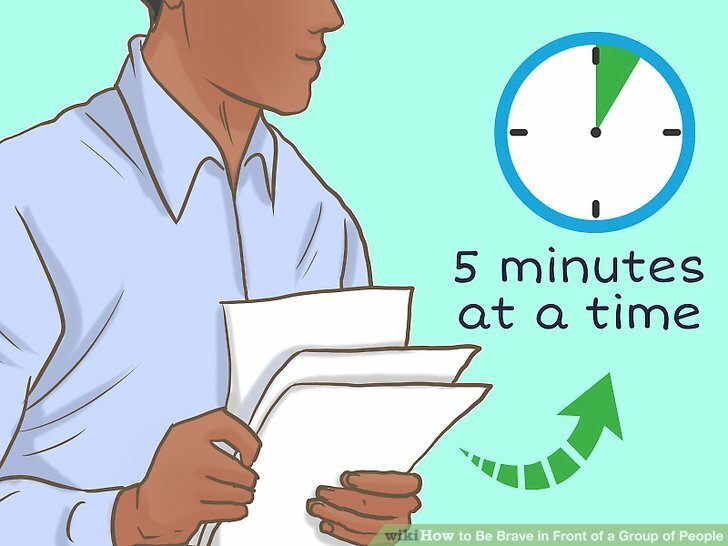 Focus on getting through 5 minutes at a time. 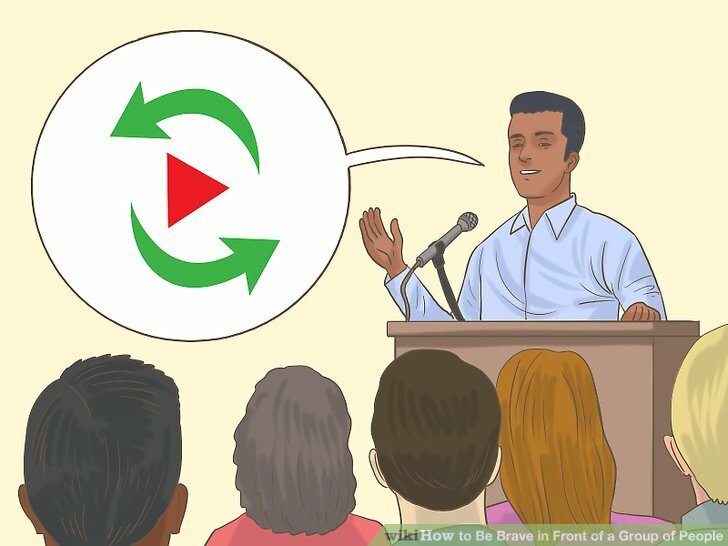 If you have to give a longer presentation, look at the time you’re speaking in 5-minute chunks. Memorize the moments in your speech that happen every 5 minutes when you’re practicing. This way, instead of worrying about the entire speech, you only have to focus on what you’re saying for a small increment of time. If you’re calm during the first 5 minutes of your speech, you’ll maintain that feeling for the rest of your speech. Speak slowly to calm your nerves. As you’re delivering your speech, it’s easy to speak too fast because you’re nervous. When you feel like you’re rushing through your speech, pause and take a breath before continuing so you can slow down. Be careful not to speak too slow or your audience may find the speech boring. 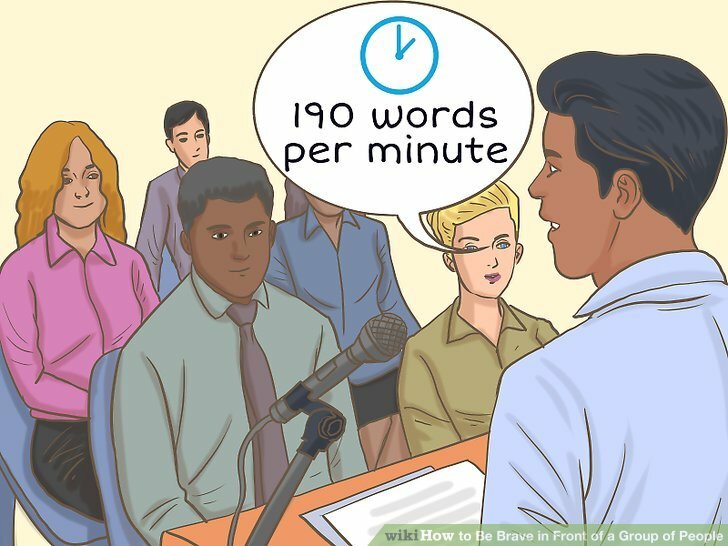 Aim to speak at approximately 190 words per minute to keep a steady, but effective pace to your speech. Continue your presentation even if things go wrong. Focus on your speech rather than any technical issues that may occur. If your microphone stops working, set it down and just continue with a louder voice. If you had a projector or a slideshow, continue on the parts of your speech that don’t require any visuals. Avoid getting stressed out over technical issues since the people working behind the scenes will be working on the problem. Don’t draw attention to your nervous feelings since it could distract the audience from the main point of your presentation. Instead, continue with your speech like everything is fine. Thank your audience for listening to you if you’re giving a speech. Make sure to say thank you at the beginning and end of your presentation so your audience knows that you appreciate them. Showing gratitude can also help show people that you are confident and makes your speech stand out more. 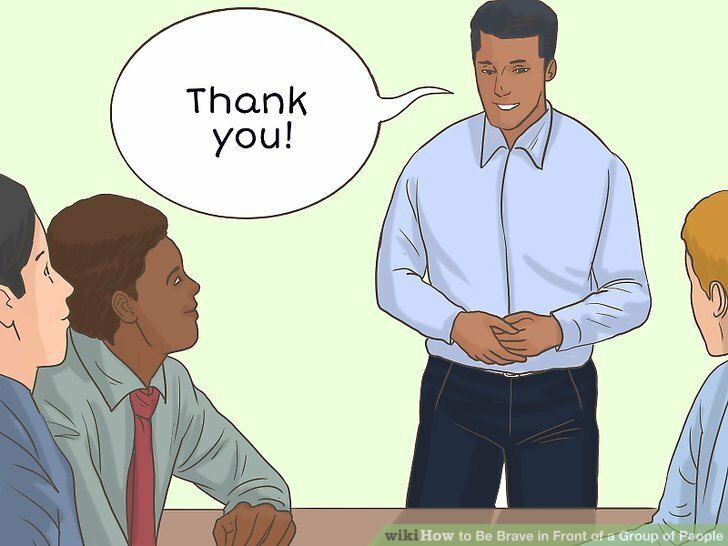 If you’re giving a presentation where other coworkers or people helped you, make sure to thank them during your speech so you give them credit. 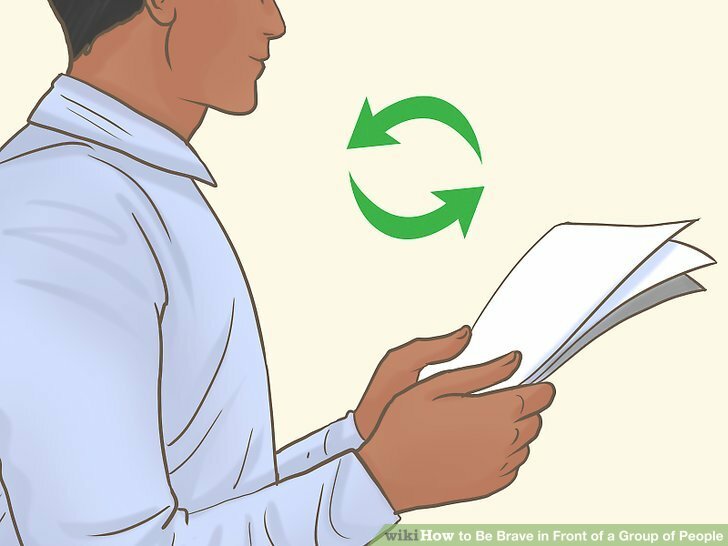 Prepare something to say before the meeting starts. If you know the subject of the meeting you’re attending, try to find a problem you want to address or a concern you have. Write them down on a notepad to bring with you to the meeting so you’re reminded to bring it up. Make sure to talk about something you’re knowledgable in so you don’t overstep any boundaries. If the meeting is about a specific problem, brainstorm a few answers or suggestions you could bring up during the meeting. Talk to other people one at a time before the meeting starts. Arrive at your meeting early so you don’t feel rushed or short on time. As other people arrive, make small talk with them so you feel more comfortable and confident. That way, you build a good repertoire with others before saying something to the entire group. Say something within the first 10-15 minutes of the meeting. If you wait too long to speak during your meeting, other people may bring up your point. Aim to be one of the first few people to speak within the first 10-15 minutes so you can establish a confident voice. Even if you don’t have something substantial to say, affirming another person’s comment can make an impact. Pose thought-provoking questions related to the meeting topic. Listen carefully to what other people in the meeting bring up and ask questions if you have concerns about their approach. Talk about “next steps” or a different method that you may think works better. As you ask these sorts of questions, others will notice that you make useful contributions and that you care about your job. Ask your manager or mentor for feedback about how you’ve spoken up. Once the meeting is over, talk to someone you trust about how much you spoke during the meeting. Ask them what you could change about how you speak to the group. They can tell you if you should talk more in the meetings or if you’re speaking too much, and offer pointers on what to do next time. Speaking to a higher-up also shows initiative in your job and makes you seem like a hard worker who’s looking to improve. 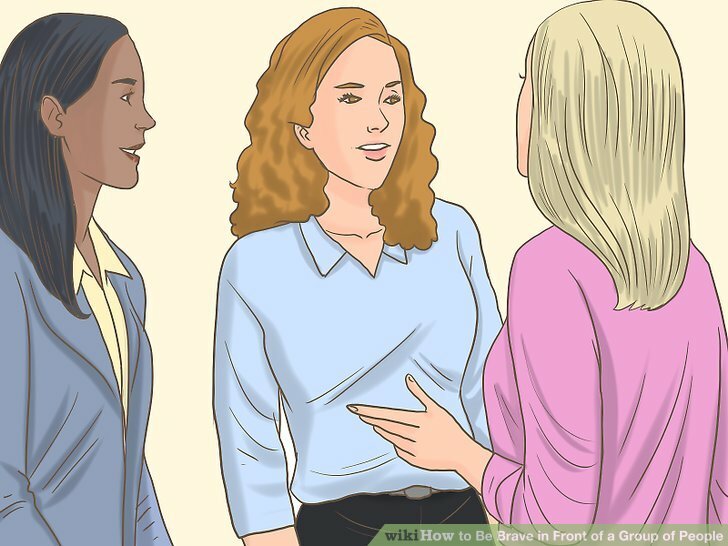 Position yourself in the middle of the group you’re talking with. 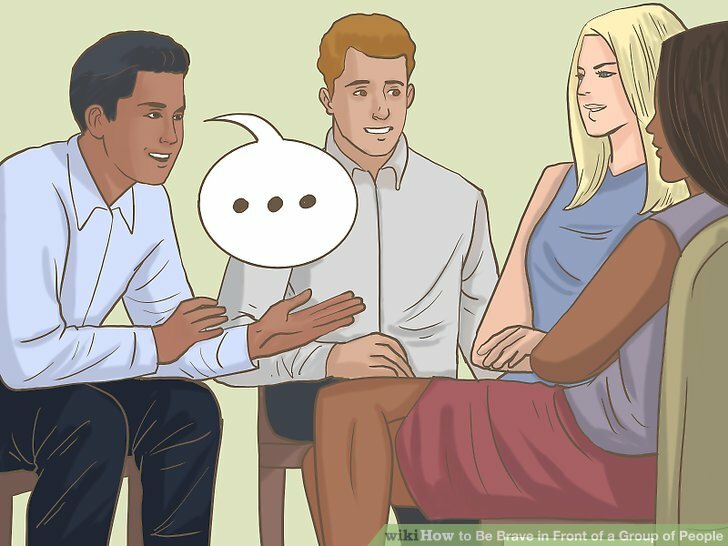 Instead of standing at the edge of a conversation, try to insert yourself into the middle of the group so you’re more likely to be included. When you’re there, others feel like you’re part of the discussion and talk to you more. 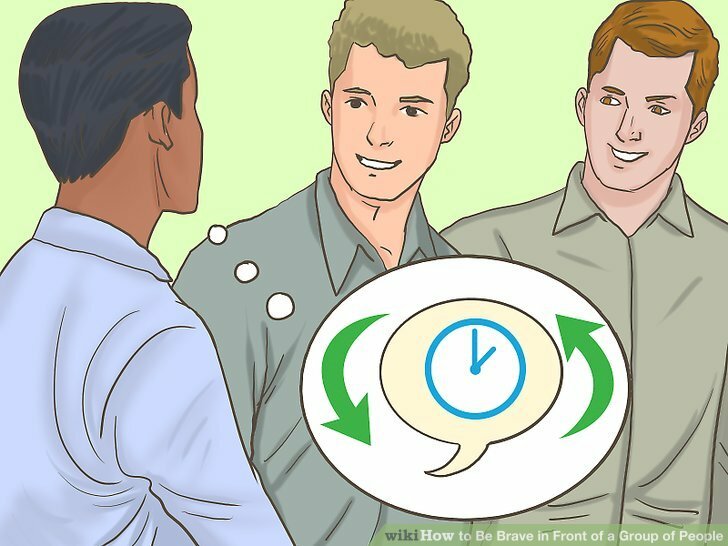 Even if you don’t speak all the time while you’re in the middle of the group, stay engaged by making eye contact and having an interested expression. Remind yourself to say something every few minutes. If you haven’t said anything in a few minutes, make a comment or ask a question related to what you’re talking about. This can help bring up new conversation topics or steer the conversation in a direction that you want to talk about. Actively listen to the conversation so you can contribute. For example, if someone mentions that they saw a movie, ask if they enjoyed it and why. If you feel too much pressure while making conversation, let yourself be quiet for a little while to ease your stress. If you're a new person in a group of people who all know each other, make sure to chime in since they may not acknowledge you as much on their own. Try making small contributions to the conversation so you don’t seem quiet. Even if you aren’t leading the conversation, you can still make your voice be heard. 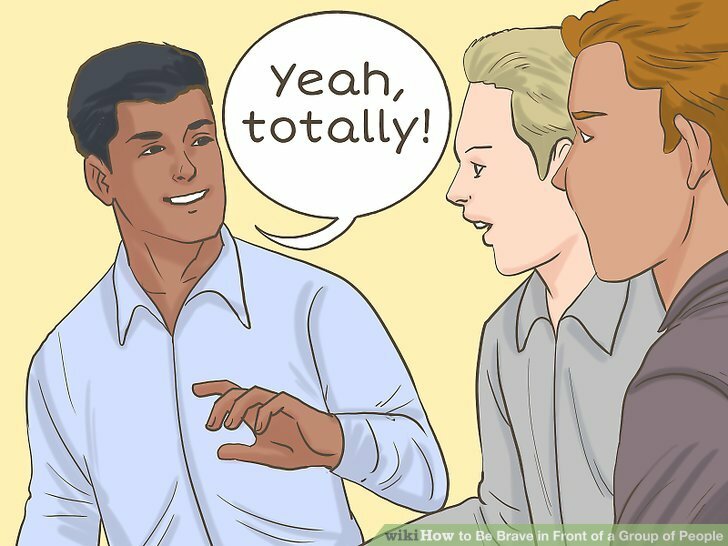 Small interjections, such as, “Yeah, totally,” or, “No way!” can help add to the conversation and make you feel like you’re involved. Starting with small talk can help ease you into being more confident in future conversations. Work your way into a conversation if you’re being excluded. If other people are talking amongst themselves but they aren’t including you, do your best to add comments or contribute your point of view. If they’re talking about something you're unfamiliar with, ask questions about it so you can feel more involved. Take slow and deep breaths beforehand. Take some time to breathe so you can calm down. 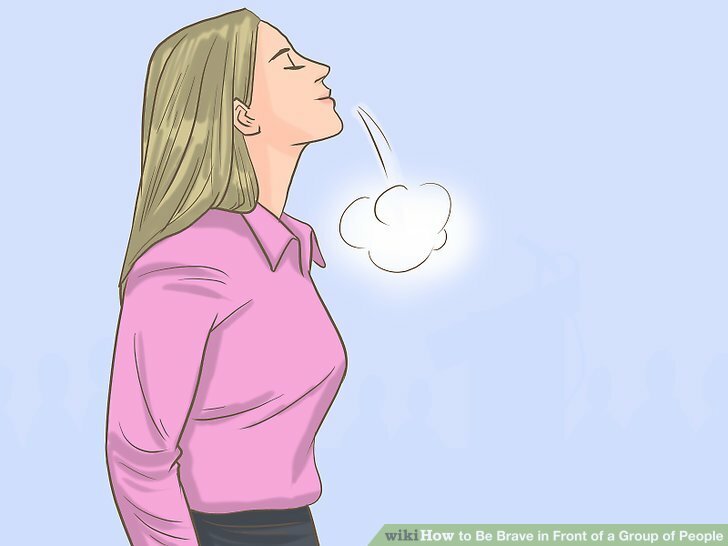 Breathe in through your nose for 5 seconds, and then hold your breath for 1 second before you exhale through your nose or mouth. Keep taking deep breaths for 2-3 minutes until you feel more relaxed. Many phone apps can guide you through breathing in order to calm down. Look for one on your device’s app store. Smile often. 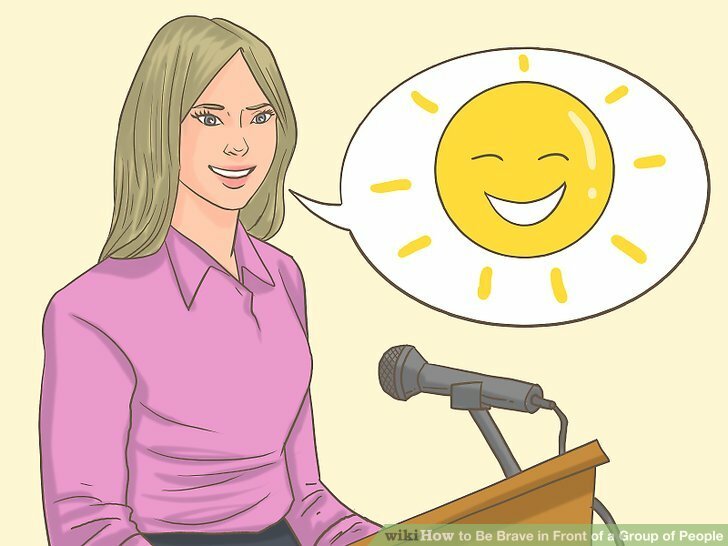 Smiling makes your voice sound happier and will help hide your nerves while you’re talking to a group of people. Others will see you as a friendly, confident, and approachable person. Make sure to smile at appropriate times. For example, smiling throughout an entire eulogy at a funeral may not work the best, but you may smile if you’re sharing a funny memory. Maintain eye contact while you talk. 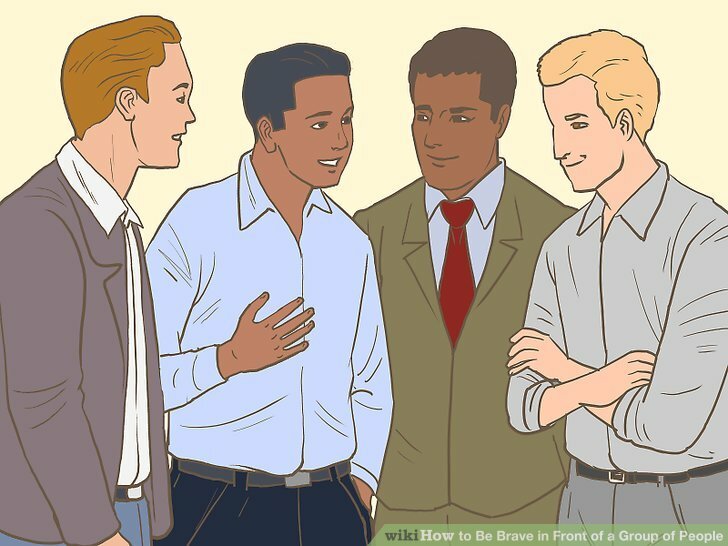 Avoid looking at a wall or the floor since other people in the group will see that you’re nervous. Pick a few people around the room to focus on while you’re talking so they feel connected with you and to draw them into what you’re saying. 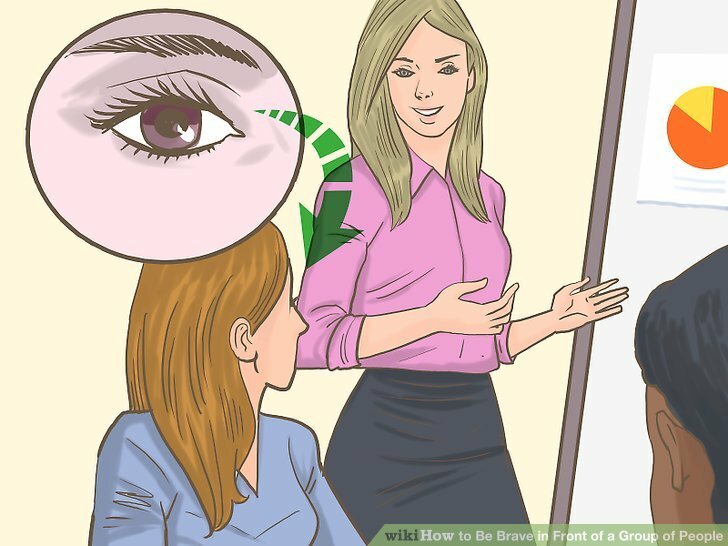 Avoid staring at one person for too long so they don’t feel uncomfortable. Keep good posture and body language while speaking. Straighten your back instead of slouching since this will make you look more confident. Keep your head high and your shoulders back so you can take deep breaths and calm down if you need to. 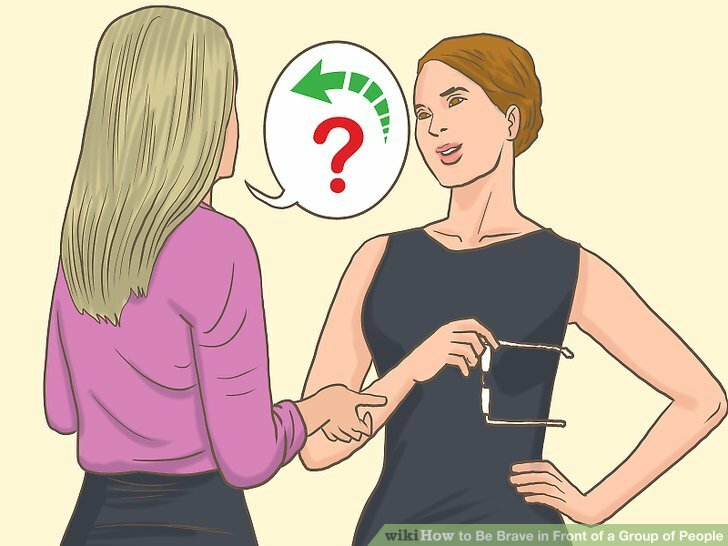 Avoid crossing your arms in front of you since it will make you seem closed off. Learn from each opportunity you have to interact with a big group so you can improve in the future. Always arrive early to places so you don’t feel rushed and anxious. Wear clothes that are appropriate for the occasion that are also comfortable. That way, you’ll feel more confident and relaxed while speaking.